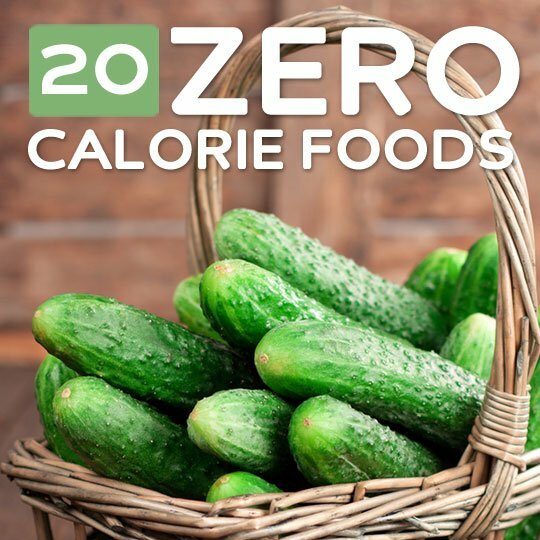 The theory behind zero calorie foods or negative calorie foods is that they contain such a small amount of calories that the energy you burn while eating them cancels out their calories. In essence, the bottom line is that you don’t take on any excess calories, and in some instances you end up burning calories as you eat them. Whether or not this is an accurate statement, it’s clear that the following 20 foods have such a slight caloric load they won’t even count in your daily calorie intake. Each of these zero calorie foods has at most 52 calories per 100 gram of serving. Since chicken breast has 172 calories per 100 grams and is considered a low calorie food, it’s clear why these foods are considered zero calorie foods. Celery is a food that when you eat it you don’t really feel like you’re eating anything, so it’s not a total shocker to find out that it has essentially zero calories. The stringy nature of celery makes it seem as if it only exists to hold the water it contains. What you’ll typically see is celery with peanut butter or cream-based fillings inside of it, and you’ll want to avoid those if you are keeping track of calories, as they can swing it back the other way quite quickly. Total calories per 100g serving: 16. Oranges are known for their Vitamin C, but they’re also low in calories compared to other fruits. Whether or not you expend the total number of calories while eating oranges is debatable, but the point of eating foods this low in calorie is not to cancel out the calories, but to keep your total caloric load for the day lower than normal. You’re trying to create a caloric deficit, and an orange can help reach that goal. Total calories per 100g serving: 47. Cabbage often gets brought up for its ability to prevent cancer and heart disease, and it often ranks on lists of foods that help with weight loss. That’s because it has a calorie count so low you end up burning it off just by going about the normal motions of your day. Cabbage soup is one great way to eat cabbage, as it is a filling meal while containing far fewer calories than most soups. Total calories per 100g serving: 25. Asparagus shows up as a side dish to many meals, and is a great choice because its fibrous nature means it will satisfy your hunger, but the number of calories makes it so it doesn’t add much to your daily total. Eating asparagus fresh on a salad is a crunchy and satisfying treat, while grilling it or steaming it are the two best cooking methods. Be sure to go easy on the butter or oil, as that will bring the calorie count right back up. Total calories per 100g serving: 20. If you’re going to use beets as a low calorie food you should stick to fresh beets that you either steam, boil, or grill. If you go with the pickled variety you’ll be adding a bit more calories to the mix. In addition to being low in calories, beets are great for the body, containing betalains, an antioxidant that gives it its color and is only found in a few select foods. Total calories per 100g serving: 43. Cucumbers contain so much water in them it’s not surprising that they’re low in calories. That’s why cucumbers make a great adornment to most salads, especially when the salad is full of other low-cal veggies. You can eat until you feel full, while still keeping your total number of calories to a minimum. Combine this sort of eating with a more active lifestyle, and you start to tip the scales in your favor, literally and figuratively. It’s not as if you’re going to sit around eating lemons in order to keep your calories down. But it’s nice to know that you can use them as much as you want and you won’t be putting much of a strain on your total calories consumed in a day. That’s why lemons are great for flavoring up a glass of water, or sprinkling on top of fish and other foods to give them a bit of zest. They’re also an alkalizing food and contain antioxidants to keep you healthy. Total calories per 100g serving: 29. Cauliflower also limbos as one of the lowest ranking foods on the calorie chart. It’s also a cruciferous vegetable and has many healthy benefits to it, including being an anti-inflammatory food, and helping the body’s cardiovascular and digestive systems. It’s a great weight loss aid all the way around, not just because it’s very low in calories. You easily burn through it’s caloric load with the act of cooking it. No matter which mushroom you choose to go with, the chances are it’s going to be low in calories. These fungi just don’t know how to be high in calories, so you don’t have to worry when using them in a recipe, or sauteing them as a side dish. Even the big, popular portabella mushroom is low in calories, having only 22 of them in a 100 gram serving. Perhaps that’s why it makes such a great replacement to high calorie beef in mushroom burgers. Total calories per 100g serving of Chanterelle mushrooms: 38. Watermelon has a low number of calories, despite being so naturally sweet. This has to be the sweetest food on our list, while still ranking considerably low in calories. The great news is that in addition to being a crowd pleaser, watermelon has antioxidants that help your body in many ways. It’s also been shown to be able to boost your metabolism, just don’t go overboard on portion sizes. Total calories per 100g serving: 30. It’s great news that zucchini is low in calories because it is a popular side dish, and can even be incorporated into things like zucchini bread. It’s a very versatile vegetable that puts up such small numbers in the calorie department, it’s hard to do any damage with it. That being said, too much of a good thing is never good, so you’ll want to use this to help you feel satisfied during a meal without overdoing it. Total calories per 100g serving: 17. Tomatoes are one of the healthiest foods you can eat, and it’s only fitting that they come in low on the calorie radar. The lycopene they contain helps prevent cancer, and staves off heart disease, so you’re doing yourself a favor each time you eat it. It also makes a great weight loss food because it has such few calories that you burn it off just getting it prepped for cooking. Combine it with other foods on this list and you’ll get a delicious, low-calorie meal. Grapefruit is often pegged as diet food, a title it deserves seeing how it has been shown to rev up a sluggish metabolism, and is recommended to heart patients after surgery. The calories on this aren’t the lowest you can find, but they’re still not worth mentioning when you’re tallying up your total calories for the day. Fruits in general tend to have more calories than vegetables, but they often bring a preferred flavor to the table as well. Total calories per 100g serving: 42. Brussels sprouts may win the award for food most often given to the dog under the table. But it’s a shame, because these little guys are packed with nutrients and clock in rather low on the calorie meter. They are also a cruciferous vegetable, so they provide similar benefits to eating broccoli, cabbage, and cauliflower. Doctoring them up with cheese or butter to make them taste better will bump up your calories, so be careful and find the right balance. You simply have to start eating more kale, that’s how good it is for you. And on top of all of the protein, fiber, vitamins, minerals, and phytonutrients it provides, it manages to keep its calories down, so it’s nothing but beneficial to you. Want a snacking alternative that’s naturally low in calories? Try baking up some kale chips in an assortment of different flavors. This is a much better alternative to potato chips. Total calories per 100g serving: 49. You probably don’t feel like eating a heaping helping of turnips, but if you did you wouldn’t really affect your calorie intake much. These vegetables show up from time to time in recipes, but most often they’ll be used as part of a side dish. You can also use them on a salad. They are an anti-inflammatory food, so they can help calm down the symptoms of several conditions caused by excessive inflammation in the body. Total calories per 100g serving: 28. The “apple a day” adage seems to hold water, with apples containing plenty of antioxidants, vitamins, minerals, and fiber. This is no forbidden fruit, and should be used as part of a calorie conscious diet to make sure that you’re not exceeding your daily allotment. Apples can make a great snack between meals to hold you over, and keep you from eating junk food or fast food in a moment of hunger-induced weakness. Total calories per 100g serving: 52. Onions are used in so many recipes it’s good that they’re low in calories. Most of us aren’t going to bite into an onion as a food source on its own. So it’s nice to know that they aren’t adding much in the way of calories when we cook with them and add them to soups and main dishes. Onions are often referenced as a healthy food that can help you reach your weight loss goals, and studies show that they contain flavonoids that help the body. Total calories per 100g serving: 40. Eating carrots to protect your eyesight is a good idea, but is just one reason to eat them. They’re also a low glycemic food, so they can help you manage your blood glucose levels. And they are an all natural diuretic, so they can help rid your body of excess sodium and retained water. They’re also an anti-inflammatory food so they can be used to help treat inflammation in the body. Total calories per 100g serving: 41. Broccoli is a wonder-food, there’s no other way to describe it. It’s a cancer-fighting food that is also very low in calories. It’s packed with phytonutrients, as well as fiber so it helps keep your digestive system humming along, which is key to maintaining a proper weight. It even contains plant-based protein which can help you if you’re resistance training to build lean muscle. Total calories per 100g serving: 34.